JMW Turner (1775–1851), Bell Rock Lighthouse (1819), watercolour and gouache with scratching out on paper, 30.6 x 45.5 cm, National Gallery of Scotland, Edinburgh, Scotland. Coasts can be dangerous. When you’re navigating a vessel near the coast, you need to keep clear, but when it’s dark, you can’t just hove to and wait until you can see better. So, at some time in the dim and distant past, people started lighting beacons at key points on the coast, to enable mariners to identify hazardous points, and to help them make safe passage. Eventually these were housed in towers, and the lighthouse was born. Because lighthouses often have to be built very close to the water, and coastal weather is notoriously capricious, lighthouses have become a symbol of humans overcoming the great forces of nature, and of the use of basic technology to preserve lives. When you stay in a hotel room near a lighthouse, the sweeping beam which disturbs your sleep is also guiding those navigating boats and ships back to their loved ones. 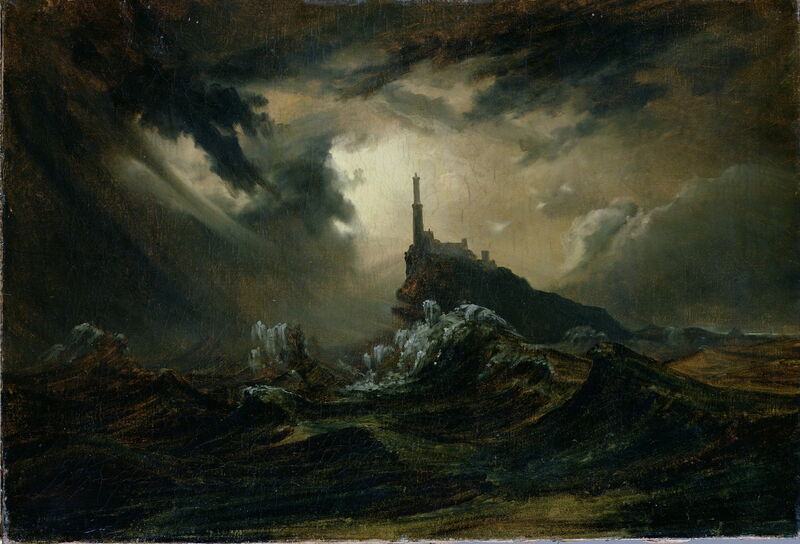 Throughout the ages, a popular image of the lighthouse is during severe weather. 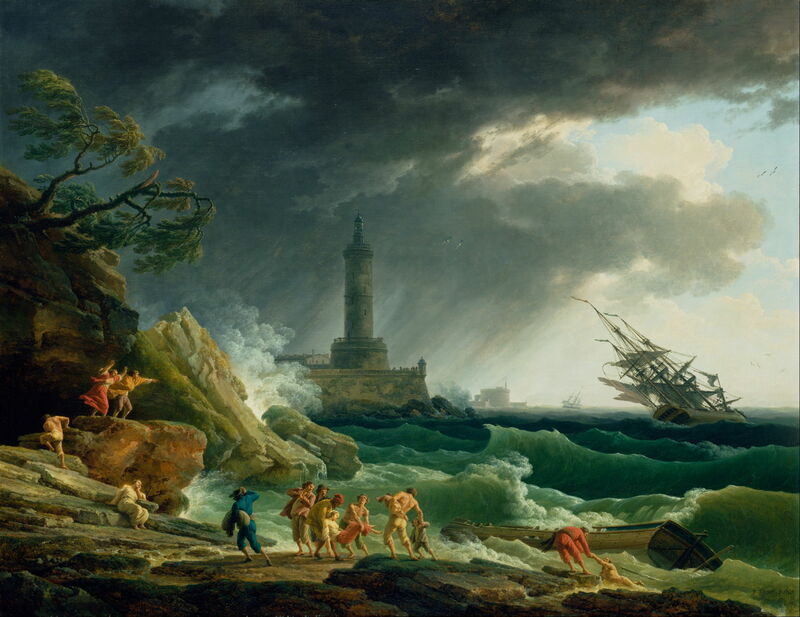 Claude Joseph Vernet’s dramatic depiction of A Storm on a Mediterranean Coast (1767) captures this forcefully. In the distance, to the right of the prominent lighthouse, is a second, set atop a round tower. Sadly, they are both too late for the survivors being dragged out of the sea in the foreground. Claude-Joseph Vernet (1714–1789), A Calm at a Mediterranean Port (1770), oil on canvas, 113 × 145.7 cm, J. Paul Getty Museum, Los Angeles, CA. Wikimedia Commons. 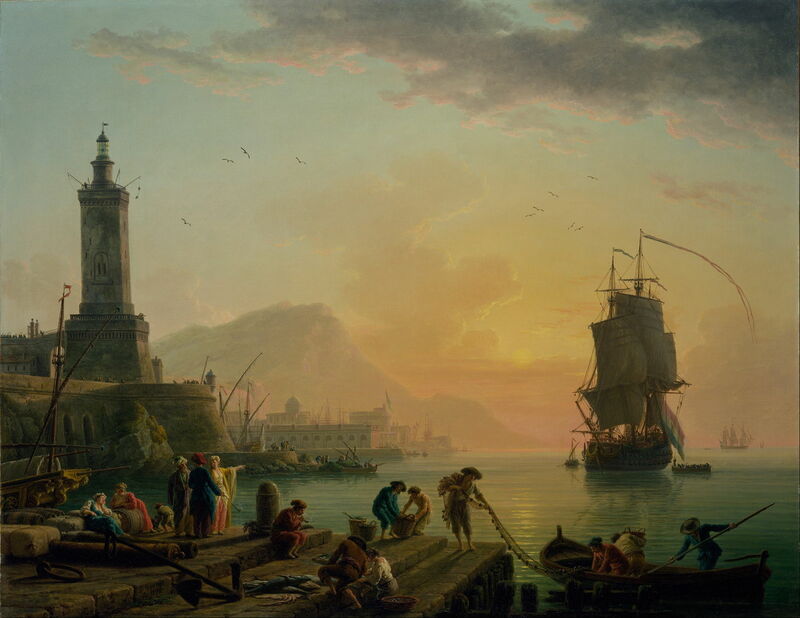 Vernet later painted what can only have been a pendant to that painting, in his A Calm at a Mediterranean Port (1770). This shows the same two towers as those in the storm, but now bathed in the golden light of dusk on a calm evening. It is odd that the assigned dates of the pair are three years apart. 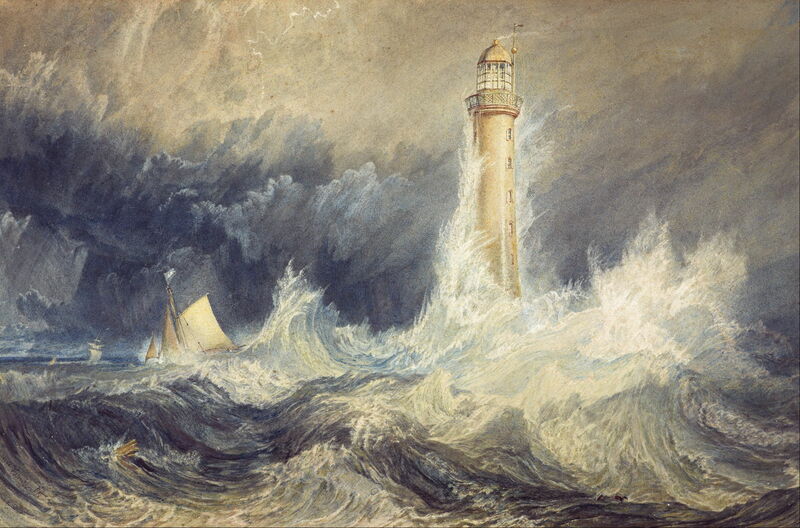 JMW Turner’s watercolour of the Bell Rock Lighthouse (1819) is not only one of his finest topographic paintings from his early career, but shows a historic lighthouse. Situated on the east coast of Angus, Scotland, it is the world’s oldest surviving lighthouse which is washed by the sea, rather than on dry land. It was built by Robert Stevenson between 1807-10, and was thus quite recent when Turner painted it. Stevenson was a civil engineer who specialised in building lighthouses around the Scottish coast, and did such a good job here that Bell Rock still stands today, and has never required replacement of any of it main structure. 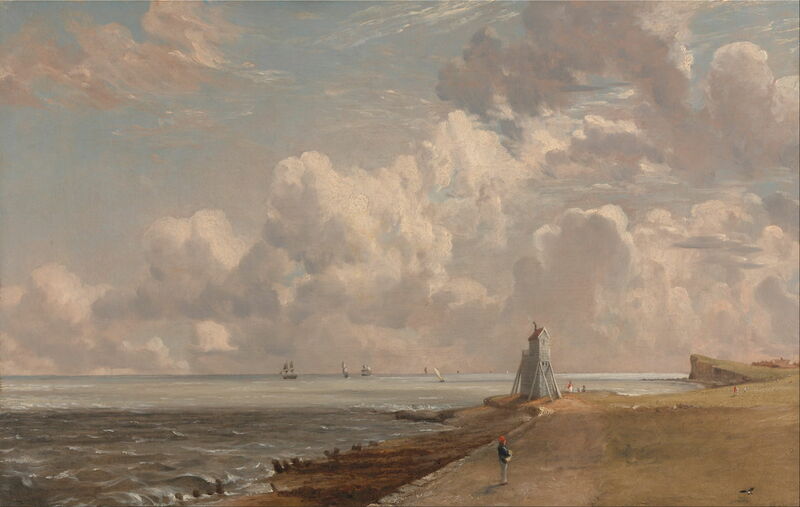 John Constable (1776–1837), Harwich: The Low Lighthouse and Beacon Hill (c 1820), oil on canvas, 33 x 50.8 cm, Yale Center for British Art, New Haven, CT. Wikimedia Commons. By comparison, John Constable’s painting of Harwich: The Low Lighthouse and Beacon Hill from about the same time may look tame. Constable uses it, though, for one of his finest skyscapes. Harwich is a major port on the east coast of England, and its lighthouses have primarily functioned to guide ships coming into its harbour. Constable shows the old Low Light, which stood on the foreshore, and was replaced in 1818 by a stone building. Constable therefore must have made his studies for this work before that replacement was built. There is also a High Light, situated further inland, which dates back to an original light from 1665. Carl Blechen (1798–1840), Stormy Sea with Lighthouse (c 1826), oil on canvas, 72 x 119 cm, Hamburger Kunsthalle, Hamburg, Germany. Wikimedia Commons. 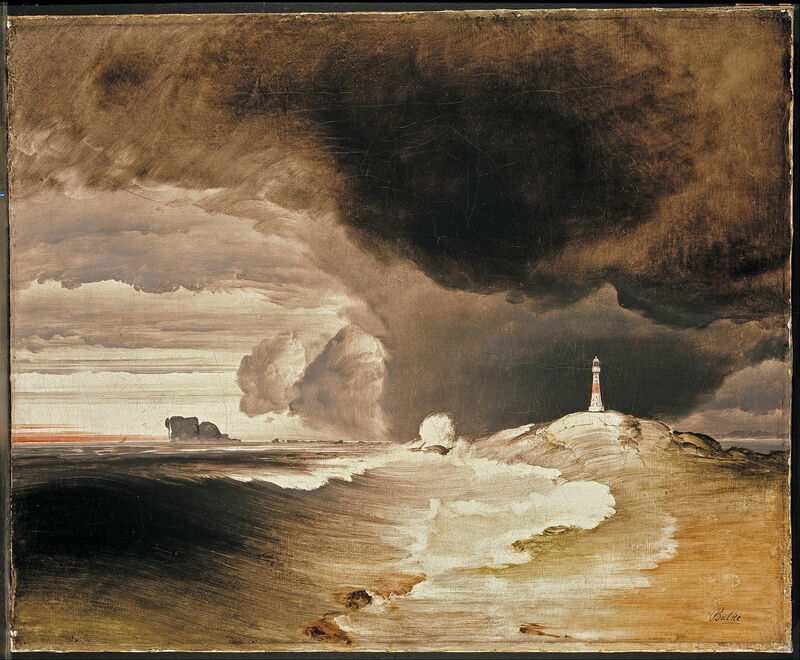 Carl Blechen’s romantic painting of a Stormy Sea with Lighthouse (c 1826) is a good example of his pre-impressionist style, with rough and painterly brushstrokes forming the sea, and more finished facture for the dramatic sky. Anton Melbye (1818–1875), Lighthouse on the Great Belt (1846), oil on canvas, 112 × 157 cm, location not known. Wikimedia Commons. Denmark is formed from an archipelago, stretching between Jutland (Jylland) and Øresund, which separates the country from southern Sweden. The Great Belt (Storebælt) separates the islands Funen (Fyn) and Zealand (Sjælland), and is now crossed by a bridge, built in 1997-98. Anton Melbye’s Lighthouse on the Great Belt (1846) shows one of the lighthouses which marked the coast beside the Great Belt. Anton was one of three brothers who were renowned marine artists of their day, the others being Vilhem and Fritz. 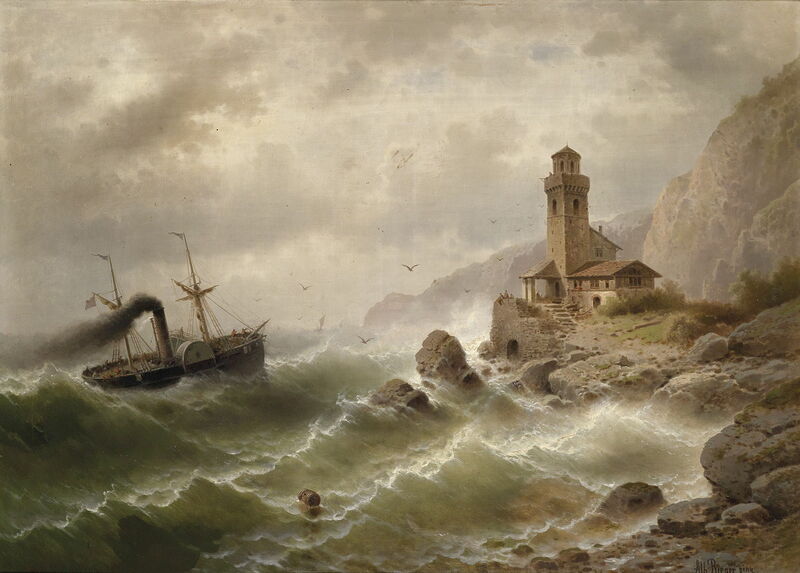 Oddly, this painting is almost identical to The Eddystone Lighthouse, painted by Anton Melbye in the same year, which was purchased by King Christian VIII, was awarded the Thorvaldsen Medal, and which transformed the artist’s career. 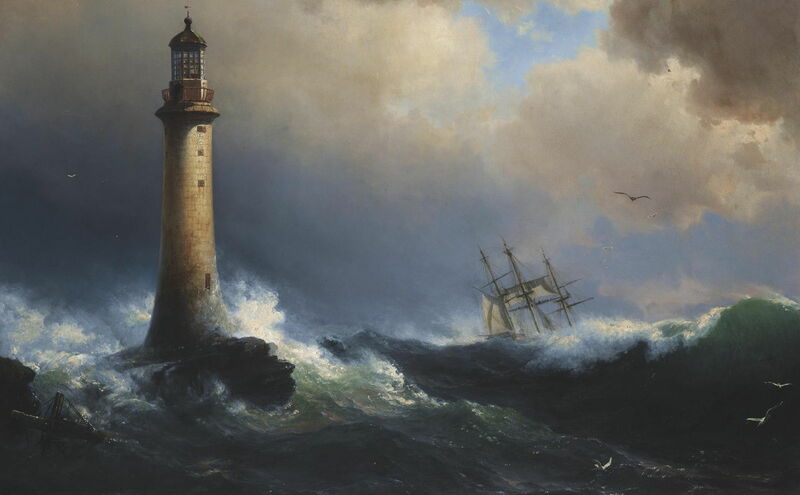 James Wilson Carmichael (1800–1868), The Irwin Lighthouse, Storm Raging (1851), oil on canvas, 81 × 100 cm, Private collection. Wikimedia Commons. 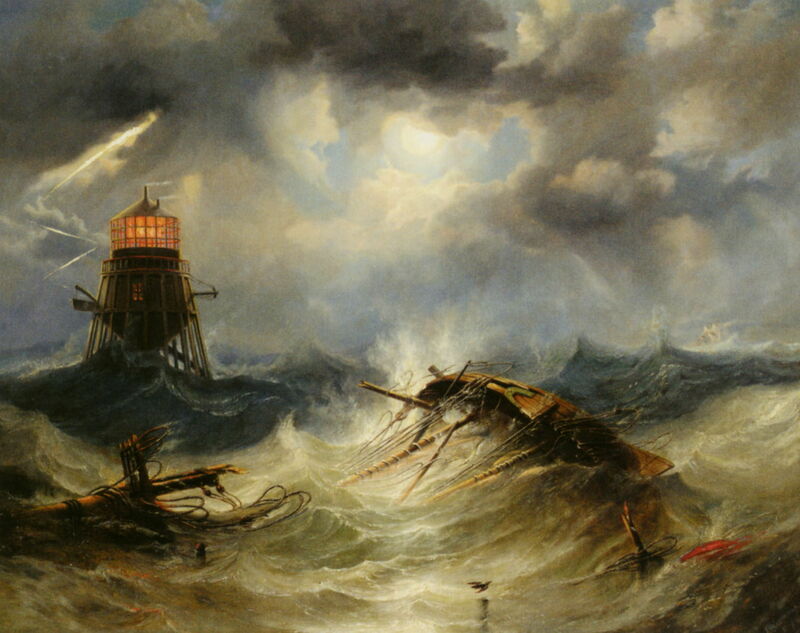 James Wilson Carmichael’s dramatic painting of The Irwin Lighthouse, Storm Raging from 1851 shows a ship dismasted and broached in front of an old wooden lighthouse typical of the period. I have been unable to identify its location. Peder Balke’s Lighthouse on the Norwegian Coast (1855) shows one of the chain of remote and rugged lighthouses which mark the treacherous hazards of the Norwegian coast. Balke was an idiosyncratic artist, who journeyed to North Cape and painted a series of works showing the stark beauty of that Arctic coastline. He was also a social reformer, and founded his own idealistic colony on the outskirts of Oslo. Vilhelm Melbye (1824–1882) (attr), Shipping off the Eddystone Lighthouse (date not known), oil on canvas, 71 × 112 cm, location not known. Wikimedia Commons. 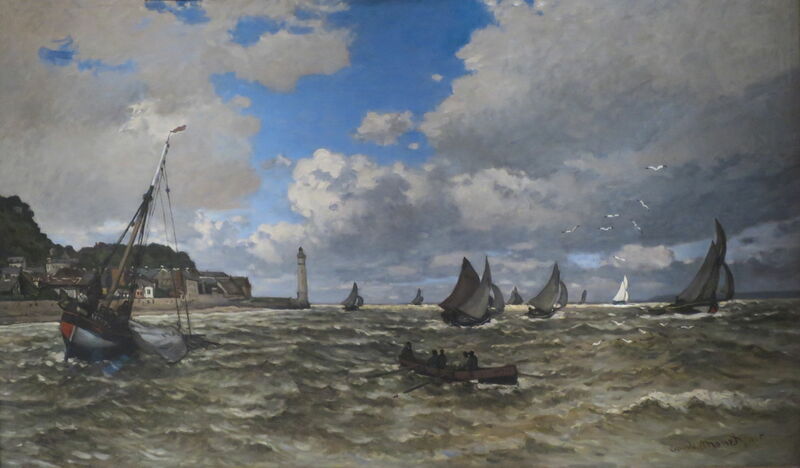 This painting has been attributed to Anton Melbye’s younger brother Vilhelm, and shows Shipping off the Eddystone Lighthouse. The Eddystone lighthouse is one of the most famous, being on rocks which are about nine miles south of the entrance to Plymouth Harbour, in Devon, England. The first lighthouse built here in 1696-98 was destroyed completely by a storm in 1703, killing its builder, Henry Winstanley, and five others. 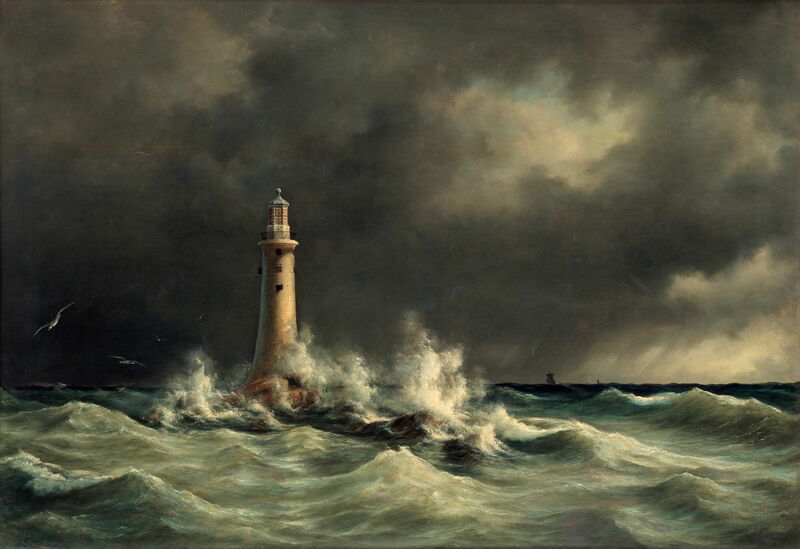 This painting shows the third lighthouse, also known as Smeaton’s Tower after its designer, which remained in use until erosion to its foundation rocks allowed it to rock in storms. The current lighthouse replaced it in 1882. François Musin (1820-1888), Old Lighthouse with Shrimpers (date not known), media and dimensions not known, Municipal Museum of Knokke-Heist, Belgium. Image by Georges Jansoone, via Wikimedia Commons. 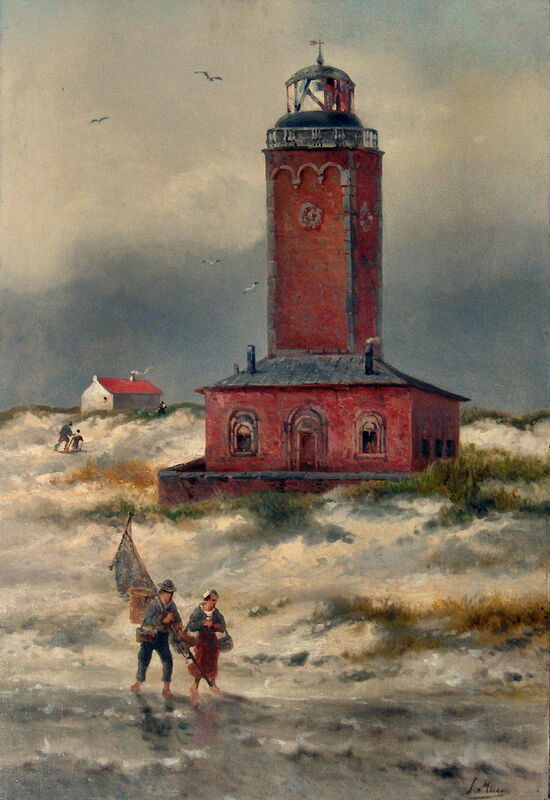 François Musin’s undated Old Lighthouse with Shrimpers shows one of a series of lighthouses built at Knokke, amid sand dunes on the coast of Belgium. The artist has depicted the dunes as if they are liquid, like the sea, and dunes and sea merge in the foreground. Claude Monet moved to the port of Le Havre, on the Channel coast of France, when he was only four years old, and it was there that Monet grew up and started his career as a painter. He made The Mouth of the Seine, Honfleur in 1865, when he was still working in realist style, although even at this stage the painterly approach of Boudin is apparent in his brushwork. 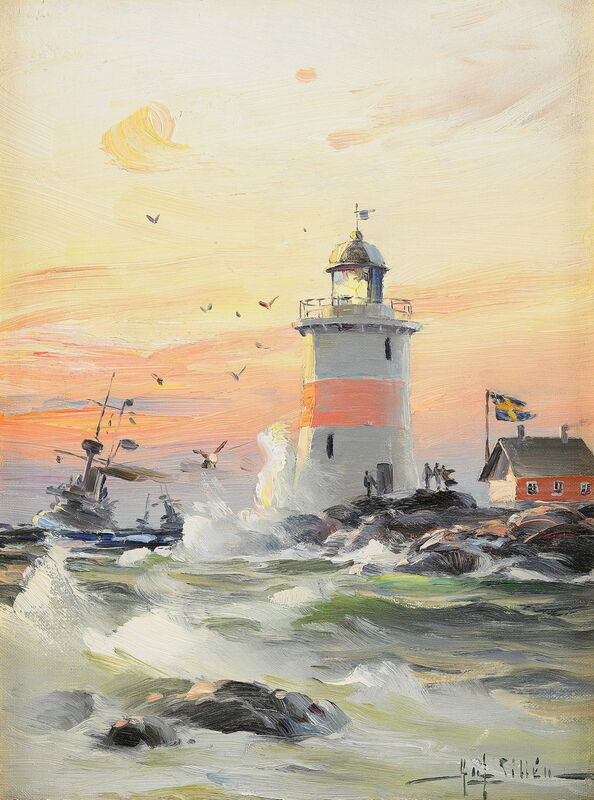 Herman af Sillén (1857-1908), Coastal Landscape with Lighthouse (date not known), oil on canvas, 37 × 27.5 cm, location not known. Wikimedia Commons. Herman af Sillén was a Swedish sea captain who was also a fine marine painter. His Coastal Landscape with Lighthouse was most probably painted after he had attended the Academy Colarossi in Paris in 1887, and features wonderfully loose brushwork. This is one of many small lighthouses around the dissected coastline of Sweden. Francis A Silva (1835–1886), Lighthouse at Sunset (1878), oil on canvas, 55.9 × 91.4 cm, location not known. Wikimedia Commons. 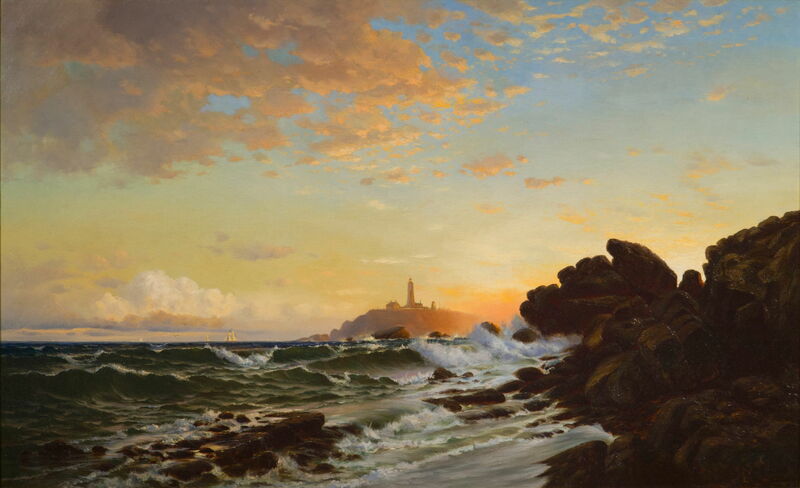 Francis A Silva’s Lighthouse at Sunset (1878) is an evocative dusk coastal landscape, by this lesser-known member of the Hudson River School. Albert Rieger (1834-1905), Steamship on the Coast (date not known), oil on canvas, 90 x 125 cm, location not known. Wikimedia Commons. Albert Rieger is another almost-forgotten landscape painter of the nineteenth century. His Steamship on the Coast shows an early paddle steamer in trouble on a rocky coast, presumably somewhere in the Mediterranean. Paddle steamers immerse very little of their paddles in the water, which allows them to have shallow drafts and thus operate in very shallow waters. However they are dangerous in rough seas, when the waves and swell leave them without any of the paddle in the water, thus little control over their course. They readily blew onto lee shores like this, and were wrecked. 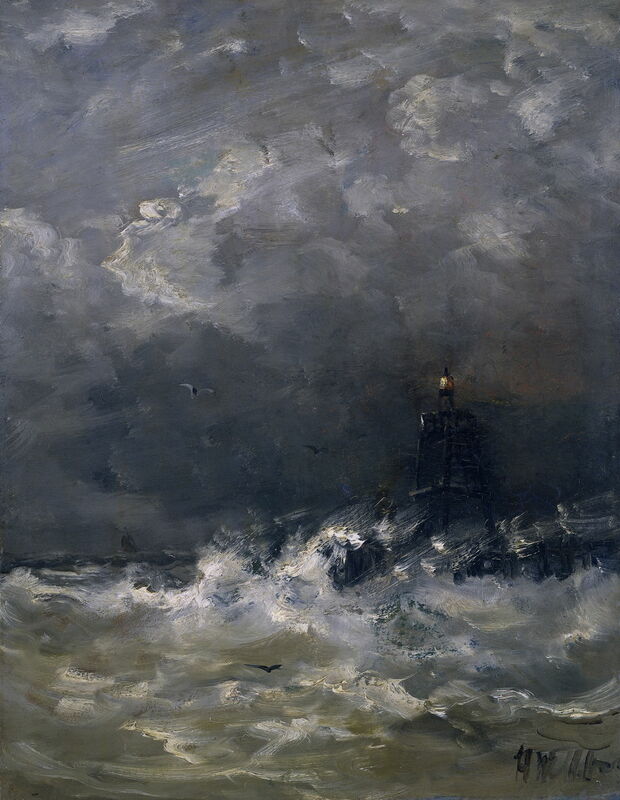 Hendrik Willem Mesdag (1831–1915), Lighthouse in the Surf (date not known), oil on panel, 52 × 40 cm, Rijksmuseum Amsterdam, Amsterdam, The Netherlands. Wikimedia Commons. You may recall Hendrik Willem Mesdag from his vast panorama of the village of Scheveningen. Mesdag was an acclaimed marine artist in the Netherlands, and his painting of Lighthouse in the Surf an original approach to its motif. Far from paintings depicting robust stone lighthouses weathering storms, this shows how weak their lights could appear. Anna Ancher (1859–1935), Moonlit Evening. Lighthouse (1904), oil on cardboard, 23 x 28 cm, location not known. Wikimedia Commons. The Skagen painters, in effect Danish (and other Nordic) Impressionists, gathered at the idyllic artists’ colony of Skagen, at the northern tip of Jutland (Jylland) in Denmark. 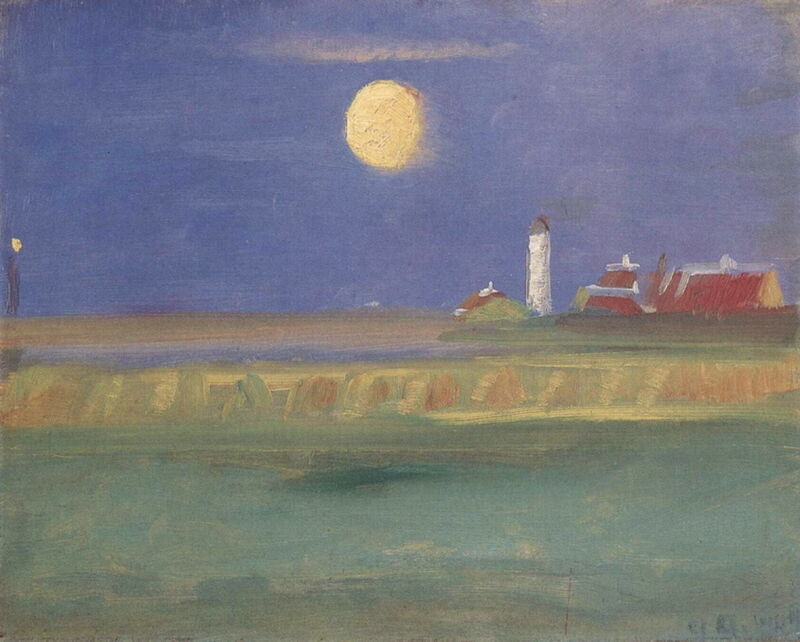 Here Anna Ancher, one of the group’s leading members, has made a very simple but effective plein air painting of the nearby lighthouse, in her Moonlit Evening. Lighthouse (1904). Michael Zeno Diemer (1867–1939), The Ahırkapı Lighthouse (1906-07), oil on canvas, 82.5 × 100 cm, Pera Müzesi, Istanbul, Turkey. Wikimedia Commons. Michael Zeno Diemer’s brilliant painting of The Ahırkapı Lighthouse (1906-07) shows one of the oldest tower lighthouses at one of the most notable coastal landmarks: the southern entrance to the Straits of Bosporus, near Istanbul, Turkey. 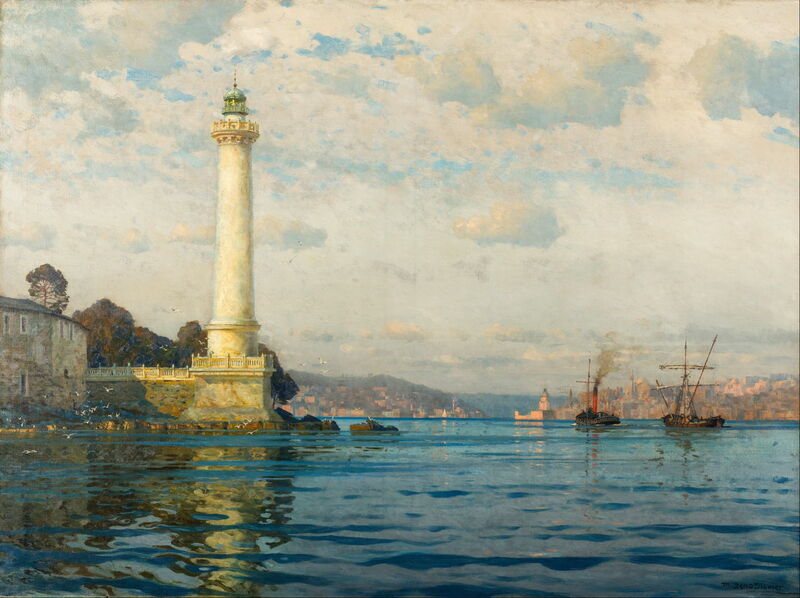 This lighthouse is on the European side; its opposite number is the Kadıköy İnciburnu lighthouse to the east, which would be off the right edge of this painting. The first lighthouse constructed here was commissioned in 1755, and Diemer shows the current one, which was first lit in 1857. Paul Signac (1863–1935), Lighthouse at Groix (1925), oil on canvas, 74 × 92.4 cm, Metropolitan Museum of Art, New York, NY. Wikimedia Commons. 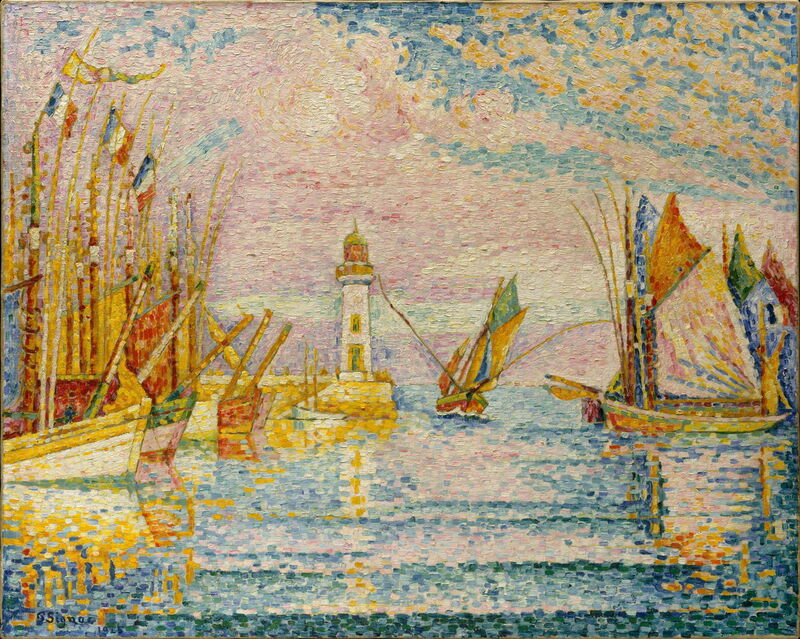 Paul Signac was a keen yachtsman, who most probably had first-hand knowledge of the Lighthouse at Groix (1925). This is one of a pair marking the entrance to the harbour of Port-Tudy on the Île-de-Groix, on the coast of Brittany, France. Forming an avenue in front of it are the distinctive local fishing boats which caught tuna, with their long yardarms. Signac uses a similar high-choma palette here in northern France to that which he used to depict the Mediterranean. I hope this small selection of paintings has shown the many attractions of lighthouses to those painting the coast. Posted in General, Life, Painting and tagged Ancher, Balke, Blechen, coast, Constable, landscape, Melbye, Mesdag, Monet, painting, Signac, Turner, Vernet. Bookmark the permalink.